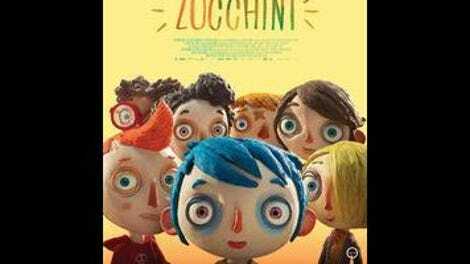 It’s not at all clear why the protagonist of My Life As A Zucchini—a French-Swiss stop-motion film that’s one of this year’s Oscar nominees for Best Animated Feature—is nicknamed Zucchini. The little boy’s real name is Icare, which doesn’t sound anything like the French word for “zucchini” (“courgette”), and he looks, as designed for the screen by director Claude Barras and his team, more like a potato, as other kids around him quickly and cruelly observe. However, Zucchini (voice of Erick Abbate) is fiercely attached to his nickname, which was bestowed upon him by his mother. That might be heartwarming, except that his mother, from what we briefly see of her in the film’s first few minutes, was an abusive alcoholic who regularly terrorized the kid—to the point where he accidentally kills her trying to escape her wrath. The backstories of the children in this movie are so damn dark that everything else has to be almost relentlessly upbeat in order to compensate. It’s a bizarre tonal mix that never quite evens out. Originally performed in French, My Life As A Zucchini is being released in the U.S. both in that version and in an English-language dub that features well-known actors like Will Forte, Amy Sedaris, and Ellen Page in relatively tiny roles. The focus here is squarely on seven damaged kids living at the orphanage where Zucchini winds up following the death of his mom. Though initially picked on, he quickly wins the respect of the local bully, Simon (Romy Beckman), and develops a crush on a strong-willed new arrival, Camille (Ness Krell). Camille, we soon discover, witnessed her father murder her mother and then commit suicide. That’s par for the course, horror-wise: Other kids, it’s strongly implied, are at the orphanage because they were being molested, or because Mom went insane. Such nightmares are strictly background, though. 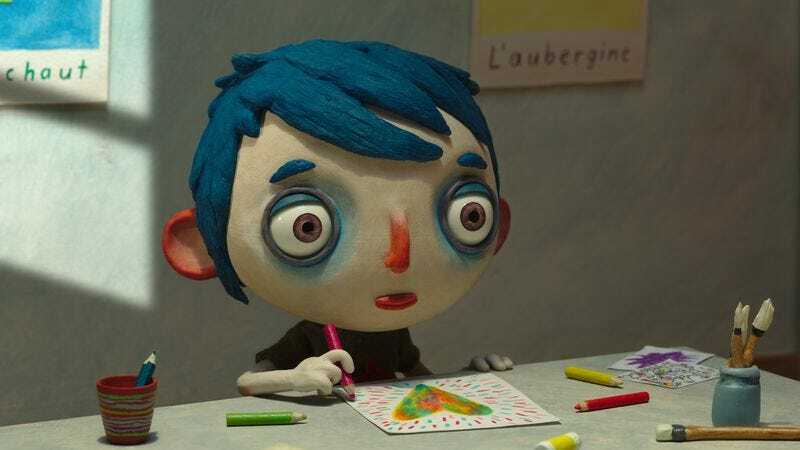 In its present tense, My Life As A Zucchini—which runs only about an hour, minus credits—could practically be an after-school special, resolving problems as speedily as they emerge and engineering an improbably happy ending. (A super-compassionate policeman voiced by Nick Offerman plays a key role in the latter.) Somehow, Zucchini is at once unusually grim and unusually saccharine. Maybe that sensibility derives from Autobiographie D’Une Courgette, the 2002 children’s novel from which the movie is adapted. Barras, however, ignores the illustrations on the page, creating a distinctive look for his first feature that’s tactile even by the standards of stop-motion animation. Objects jump right off the screen—showing this in 3-D would be redundant—and bright shocks of color are everywhere. Character design is equally bold: Eyes are enormous and ringed, like ship’s portholes; noses are sharp and red; arms are freakishly long and bendy; hair is draped over skulls in a way that suggests grasping fingers. So much care has been lavished on every aspect of Zucchini’s visual scheme that the film’s slender, lightweight narrative feels even skimpier by comparison. Throw in the sheer life-warping awfulness of the kids’ personal histories and the overall impression is one of near-manic reassurance that everything will be okay, as offered by the fear’s very source. (See also: Zucchini clinging to the nickname given to him by his abuser.) The movie is a pleasure to look at, and often genuinely sweet, but it’s also akin to scaring the crap out of a little kid for 30 seconds and then smothering her with cotton candy for an hour. Skip the first part and you don’t need the second part, either.